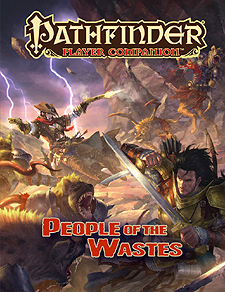 Life might be scarce in the barren corners of Golarion, but Pathfinder Player Companion: People of the Wastes provides all the tools you need to become a master of wasteland domains. Whether your character is roaming the magic-singed lands of the Mana Wastes, the flooded fields of the Sodden Lands, the blighted depths of the Fangwood, or the demonic wilds of the Worldwound, this book offers advice, class options, and gear that allow her to survive and thrive where no hero ever should. Find the perfect trail for your wasteland-born character, or just the right archetype, feats, or spells to reflect her training in a harsh locale. class features, feats, and items that interact with primal magic, including the primal shaman, who can commune with the unstable spirits that linger where primal magic reigns. A host of new firearms and gun-toting archetypes for characters who hail from the Grand Duchy of Alkenstar, including the gun chemist alchemist and the gun smuggler rogue. New witch hexes and vigilante talents for characters living in boggy wastes, plus ranger traps and the Nightwarden ranger archetype for those who tread blight-filled lands.